Our professional team takes care of all your needs when it comes to the maintenance of your vehicle. Whether it be the required services, rego checks, warranty jobs, accessories and part fittings, Woodleys Isuzu UTE Service Department will take care of you and your vehicle. Why not come in and ask one of our staff to show you around. Click a service date on the calendar below to book your next car service online now. Please note dates are indicative only, and bookings are subject to availability and confirmation from one of our service representatives. For the ultimate peace of mind, every Isuzu D-MAX and MU-X comes standard with a comprehensive, bumper-to-bumper 5 year/130,000km^ warranty. Our 5 year Isuzu UTE Roadside Assistance Program gives you worry-free motoring and ensures that you're covered for any unexpected bumps in your journey. It's complimentary on our entire Isuzu D-MAX and MU-X range. Enjoy the peace of mind knowing there will be no surprises in your servicing costs and ensure you get the most from your vehicle by servicing it with our highly-skilled, factory trained technicians. Service your vehicle with your Isuzu UTE Dealer for genuine service. Experience our professional customer service advisors and factory trained technicians who will ensure your vehicle receives the expert care it deserves. ^5 years/130,000km whichever occurs first, for eligible customers. Excludes trays and accessories. 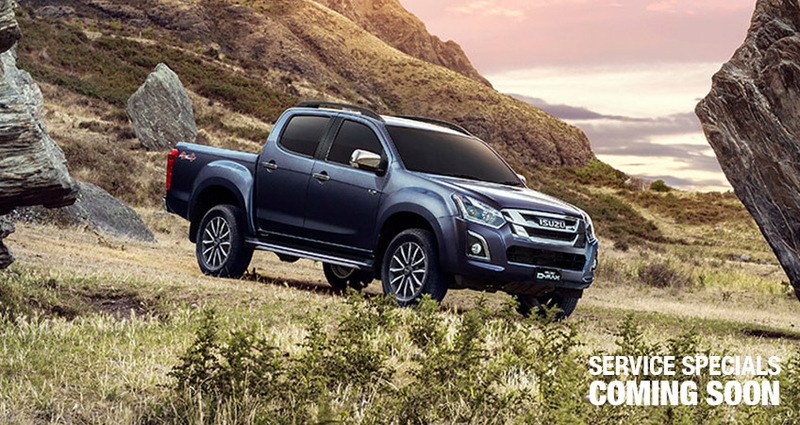 >The Capped Price Servicing Program ("CPS Program") applies to Eligible Vehicles with a Warranty Start Date on or after 1/1/15 at Participating Isuzu UTE Dealers only. The 5 years Capped Price Servicing covers the first 5 Scheduled Services for 16.5MY and later vehicle models for up to 5 years/50,000km (whichever occurs first). The 3 years Capped Price Servicing covers the first 6 Scheduled Services for vehicle models earlier than 16.5MY for up to 3 years/60,000km (whichever occurs first). CPS Program is subject to change. For full terms & conditions and current pricing click here.